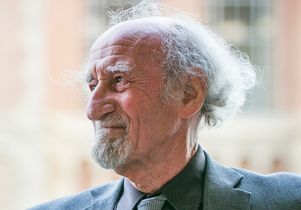 The native Hungarian, who has dissected European history and its economies in more than 30 books, devoted three years to investigating what went wrong and why. 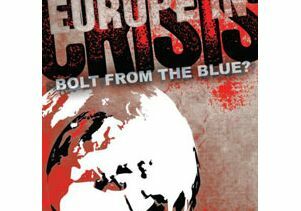 In his book, “Europe in Crisis: Bolt from the Blue?” (Routledge), Berend analyzes the European Great Recession of 2008-12, its economic and social causes, and its historical roots. He also discusses policies that have been adopted by the European Union to find a way out of the quagmire. “I try to discuss the issues without using jargon,” explained Berend, whose next book, on the economic history of the 19th century Europe, will be out this year. “As a result, people come to me and say that they believe that they understand the crisis for the first time.” Following a recent presentation at UCLA’s Center for European and Eurasian Studies, Berend sat down with writer Meg Sullivan to discuss the crisis. In your book, you say that the Euro was born with a “birth defect.” What do you mean by that, and what role did this defect play in precipitating the European economic crisis? When the European Union introduced the common currency and a central bank for the euro zone, it did not unify the fiscal policy of participating nations. Fiscal policy remained in the hands of each nation. So from the beginning, the EU has had no control over taxation, budgetary and indebtedness policy in member states. To this day, there are no precedents for such an arrangement. Monetary and fiscal policies have to be in harmony, and other economies are based on this immutable truth. As a result of this birth defect, fiscal failures in some peripheral EU countries have led to dangerous levels of indebtedness and bankruptcies that have threatened to undermine the common currency. You’re also skeptical about the initial composition of the EU. What’s wrong with the composition, and why is that important for the fate of the Euro? From the early 1980s on, the EU over-expanded by accepting several peripheral or less developed countries that were unable to perform as economically equal partners with the rest of the EU nations. Several of these countries lost competitiveness in the common market and accumulated huge trade deficits, as Greece has done. Corruption, cronyism and tax evasion also played havoc with responsible fiscal policy in some of these countries. According to the so-called corruption perception index, Greece is the most corrupt country in Europe. It is probably not fair to name only Greece, because Central and Eastern European and Mediterranean countries have a lot of similarities from this respect. As soon as the international financial markets froze following the 2008 collapse of Lehman Brothers, countries that had been managing their debt by taking on new credit had nowhere to turn. Since the fall 2008 collapse, six EU countries went bankrupt and needed bail-outs. What’s your opinion of the austerity measures that are being taken to deal with the crisis? Understandably, steps to sharply cut state expenses and　increase the retirement age are not popular and tend to generate resistance, demonstrations and even violent revolts. In these countries, these steps also raise some anti-EU and anti-German sentiments because Germany is the main advocate of austerity. Several experts criticize the policy as counterproductive and warn that it is likely to lead to a new recession. But I do not agree. Hyper-consumerism, especially in the less developed peripheral countries, is to blame at least in part for the crisis: Citizens in these countries were living well beyond their means because cheap credit made them feel richer than they actually were. 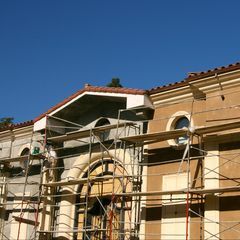 With only 60 percent of the U.S.’s per capita GDP, Spain and Ireland had a higher percentage of home ownership than America — 80 percent there as compared to 67 percent here. In Britain and several Mediterranean and Eastern European counties, household indebtedness increased by between two and five times in the decade leading up to 2008. In a single decade during the 1990s, car ownership across the EU increased by 50 percent. Austerity measures, besides balancing budgets, will have an “educational” function, by resetting consumer behavior to more sustainable levels. Everybody seems to agree that fiscal and monetary unification is required to save the Euro. What approach to integration do you favor and why? There’s no question about the need for further integration to solve the problem. Fiscal unification, however, is a difficult problem to address from a political perspective. Independent nation states are not ready now to have one center in Brussels that decides taxation and budget policy for the whole union. But the EU can set certain policies that apply to all countries, such as limits on indebtedness relative to GDP, and levy penalties to enforce the rules. These steps are already underway, and I support them. I also find hope in a so-called two-tier or multi-speed union that got a shot in the arm a couple of months ago. A core group of the 27 EU member countries committed to go faster and further in integration than the rest, and the group will proceed without all the others. The rest can join when they’re ready and want to do so. Will Britain or other countries leave the EU? Would you support their exit? In spite of all the efforts that have been made on their behalf, I cannot exclude the possibility that Greece or some other troubled country might drop out because of financial default. Traditional euro-skeptics like Britain or extreme nationalists such as some of the former Soviet Bloc countries may also decide to step out. In my view, such a "slimming" would not weaken the EU because these countries tend to stand in the way of further integration. Countries that want to enjoy the tremendous advantage of the common European market, but are not ready to shoulder the burdens, ought to be allowed to leave. When will the Euro crisis end? The EU has made a gigantic effort to solve the problems that led to the crisis. It used taxpayers’ money to assist troubled countries. Greece received several times more EU assistance than Germany received from the Marshall Plan program after World War II. A fiscal and monetary unification　is in the making. The European Central Bank made very successful efforts to defend the Euro. In spite of several black prophecies and forecasts, the EU is coming out from the crisis. And in a couple of more years it will fully recover. It does not mean, of course, that some countries still would not　have difficult years ahead, but the EU will emerge from the crisis stronger than before. Ivan Berend, UCLA distinguished research professor of history. 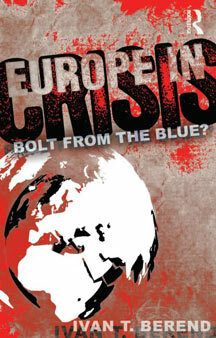 Book cover of “Europe in Crisis: Bolt from the Blue” by UCLA professor Ivan Berend.